I've been sanding with an electric sander the past couple of days in my driveway work space. 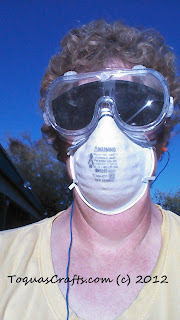 I have ultra sensitive eyes to the sun, so I need sunglasses as well as the goggles to keep the sawdust out of my eyes. My ex-husband thought I was mad at him one time when I'd forgotten my sunglasses and I had tears streaming down my face! LOL I don't sneeze as much when I wear the mask... Guess my sinuses and lungs don't appreciate breathing in sawdust! When my husband returned home from work today he just laughed at me. A man that makes sure that his guys at work are all safe laughs at me when he gets home?? What's up with that? Soon... I'll be posting the "new" project. 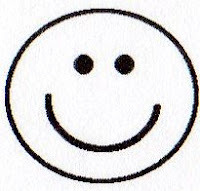 I'm smilin' at you... don't you see it?? I like to practice what I preach. Oh my I just love your new style! You'll be starting a trend for sure! Can't wait to see what you've created!